I had dinner with a college friend I hadn’t met in a while. The weather was cold and windy, which was appropriate for noodle soup! We were thinking of getting ramen but since I hadn’t been to Ringer Hut yet, we decided to go there for champon and catch up! Champon is a Japanese noodle soup, that is similar to but different from ramen. Ringer Hut is a Japanese fast-food restaurant chain specializing in champon and other Japanese Chinese dishes. Ringer Hut can be best described to Americans as the Denny’s of Japan. There are only two locations in the United States, in Honolulu, Hawaii and San Jose, California. I ordered a small bowl of champon, for $7.00 USD. Ringer Hut also has champon in regular and large size for $8.00 and $9.70 USD, respectively. There are also several combos as well, for the regular and small sized champons. My friend got the small champon combo with 6 pieces of gyozas for $9.70 USD. There were some condiments available for use on the table that included soy sauce and ground red chili pepper (ichimi tōgarashi, 一味唐辛子). We sprinkled some ichimi tōgarashi onto our champon to add a little spiciness into it. Champon is considered as cold weather comfort food to many Japanese. The broth is light and simple with lots of vegetables, which makes it easy on the stomach! 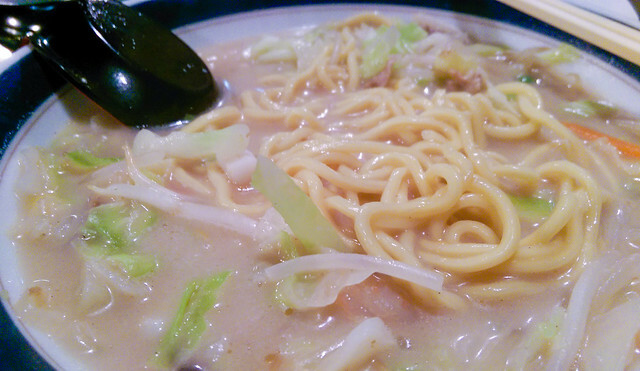 Champon (ちゃんぽん chanpon), also known as chanpon, is a noodle dish that is a regional cuisine of Nagasaki, Japan. Due to the inspiration from Chinese cuisine, it is also a form of Japanese Chinese cuisine. Champon is made by frying pork, seafood and vegetables with lard; a soup made with chicken and pig bones is added. 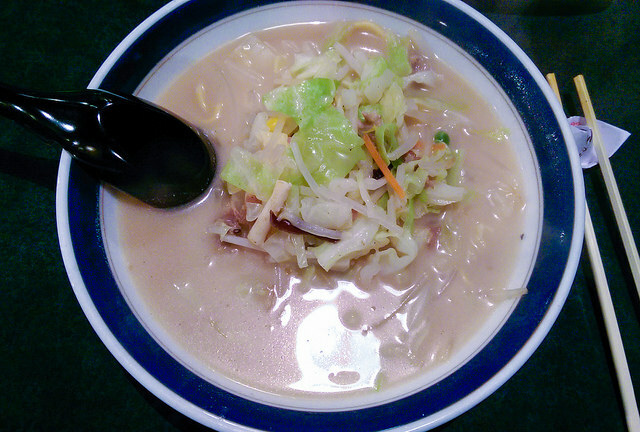 Ramen noodles made especially for champon are added and then boiled. Unlike other ramen dishes, only one pan is needed as the noodles are boiled in the soup. The word champon derives from the Fujian word shapon (吃飯), which means “to eat a meal”. Champon is made by frying a combination of pork, seafood and vegetables in lard before a soup made from chicken and pig bones is added into the pan. Then the very different cooking style happens – the noodles are added straight into this mix and boiled in the soup. The noodles are similar to the normal ramen style but are slightly different so they cook properly this way. It’s based on Chinese cooking and actually takes its inspiration from a dish in the Fujian province of China. It was first served in Japan at a restaurant in the city of Nagasaki which was popular with Chinese students. It was supposed to be something cheap and filling for them which was still Japanese but also similar enough to their native food. These days Champon is still most popular in the Nagasaki region but it has spread across all of Japan and can occasionally be found in ramen restaurants. Because it is cooked in a slightly different way, not all noodles bars will offer it because it involves having another setup for the cooking. Nagasaki chanpon was created when Chin Heijun, a Chinese restaurant owner in Shikairo, suggested a cheap and nutritious dish for visiting Chinese students who lived frugally at the time. The first version was just a simple combination of pork and bamboo shoots, but eventually it came to include locally abundant ingredients and seafood such as squid, oysters, and shrimp harvested from Nagasaki’s coastal waters. Also characteristic is the unique flavor achieved by adding Chinese lye to the noodles, which is normally included in the skins of Chinese dumplings. The origin of the word “chanpon” is the Fujian word shapon, which means “to eat a meal.” Some believe it combines the sound of the Chinese bell, chan, and the pon sound of Japanese drums. One can say that Nagasaki’s chanpon is a specialty born in Nagasaki yet matured under the influence of its creators, ingredients, and environment. So making chanpon is basically making ramen soup, except that you fry the accompanying ingredients first before the usual cooking steps.